Shin Yeh seems to be a popular name for restaurants around here! It means “Vivid Leaves” in Chinese. This particular restaurant serves popular Taiwanese food that you should be able to find almost anywhere, at any food stand around the city. The difference is likely in the degree of cleanliness, the atmosphere (a hotspot for business meetings – every table around us was definitely at the restaurant in a work context) – the speed of the service though, is probably the same. Less than five minutes after we ordered, every dish was on the table, hot and ready to eat. One of my favorite items of all time are the pork knuckles. These are a one year kind of thing since there is so much fat on the meat, the dish is really unhealthy. But, the most unhealthy things for you usually taste the best, am I right? Plus I and my mother are the only ones who eat it at home. Trust me though, we finished up that plate pretty quickly. 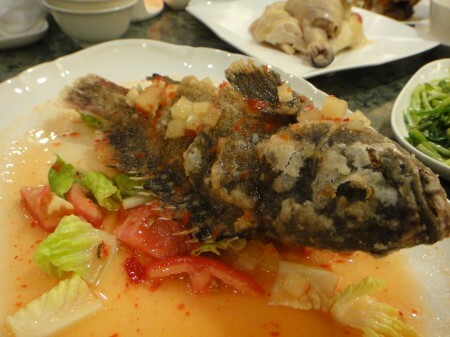 The fish was delicious – it was sea bass served Thai style with a hot and sour sauce and pineapples. Can’t really go wrong there. The dessert was almond tofu with some mango inside – the almond tofu had a gooier, stickier texture than I’m used to. Good nonetheless though. The almond milk soup and the fried bun is a traditional dessert in Taiwan – it didn’t agree with me as much. I found the soup a little strange tasting – it was midway between sweet and a little bitter. Not sure how that happened, but I finished it anyway. Shin Yeh is a great place regardless of whether or not you’re a novice to Taiwanese food – their menus even come with a decent English translation! The pictures are a nice touch too. Tags: Almond, Almond Milk, Almond Tofu, Anchovy, Buns, Congee, Fried, Grill, Pork, Pork Knuckles, Sea Bass, Shin Yeh, Sweet Potato, Taipei, Taiwan.